My mother was born in Eastport, Maine about ninety minutes north of Arcadia. We would visit her home town at least once every year and when my parents retired they bought an old farm house and spent summers in the area. All the while I was growing up and into early adulthood I would visit Arcadia and I came to consider it my “home town National Park.” Because of my familiarity with the park and my unbridled love of the area I was very excited to take a trip with Rita and Alex and act as tour guide. We booked a room at the Wonder View Inn on a bluff overlooking Frenchman’s Bay. The view of the bay was spectacular out the window with views of the bay and visiting cruise ships. A reasonable $150 per night provided a clean, comfortable moderate level accommodation. You will most likely be flying into Bangor or driving up from Portland or southern New England. Either way you will be passing through the gateway city to the park Ellsworth, Maine. Ellsworth is a typical National Park border town with fast food restaurants, numerous mid-range brick and mortar restaurants, Walmart, etc. 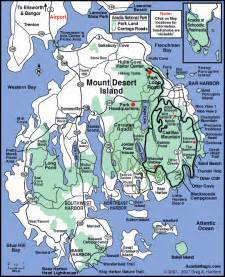 Stock up on needed supplies for picnics, hiking supplies and other sundry items before crossing over to Mount Desert Island the site of the park. We drove up route one from our home in New Hampshire leaving early in the morning. Our first stop for lunch was in Camden, Maine. We drove up the auto road to the top of Mount Battie where we climbed the tower and had a pleasant lunch overlooking the harbor. Across the street from Mount Battie you will find the Camden Hills State Park with access to the bay. A quiet and peaceful rest stop. After lunch we continued north. One stop I highly recommend as an interesting diversion, especially if you are driving up on Route 1 from the south as we were, is the “Big Chicken Barn Books and Antiques.” It is exactly as the name implies an old chicken barn turned into an antique shop and used book store. The entire second floor of the barn is dedicated to magazines and books. It is a great way to spend an hour and pick up some treasures before embarking on your tour of the park. After checking into the Inn we decided to get some dinner at the restaurant adjacent to the hotel. The Looking Glass Restaurant had the same spectacular view as the hotel room and being able to sit and enjoy dinner while watching the harbor made it all the more special. As we were waiting for our meal we saw the chef hop out to the garden and snip a few herbs, the resulting meal was exceptional. The next morning we made our first stop at the visitor center so that Alex could pick up his junior ranger workbook. The visitor center has several displays, a nice book store and a short film about Arcadia. There is a passport to the National Park stamp cancellation station here but Arcadia has a wealth of stamp locations at many sites around the park. I will make note of them in the body of the blog as we get to certain areas. From the visitor center take the Park Loop road; this is a one way road going along the coast with numerous pullouts and stops for sightseeing or hiking. The first point of interest is the Sieur de Monts Spring. There is a small walk through botanical garden with local plants and a small visitor center with a unique passport cancellation station. Proceed out the back of the visitor center and a short walk will bring you to the Abbe Museum. There are some native American artifacts and some craft items for sale. Next up is the Precipice Trail. I have not done this trail for many years, not since I was much younger. It is less than a mile to the summit but it is literally straight up the side of a mountain. There are spaces where metal rungs are driven into the cliff face and narrow ledges and ladders in other places. My nephew and I did not have too much difficulty but when we got to the top and looked down we had second thoughts. We decided to take the gradual descent along a ridge line but the hike down was more than five miles. Be prepared and bring plenty of water but a great experience. Next up is Sand Beach. As the name suggests it is a sandy beach area which is not easy to come by on the typically rocky coast of Maine. The water is Northern Maine cold! Thunder Hole is the next stop. There is a small gift shop with another unique cancellation station for your National Park passport. When the tide is right the surf comes crashing into a rock crevasse causing a loud thundering sound and a huge splash. If you catch this during a storm surge it can be really spectacular. The Park Loop is a one way two lane road so if you see an interesting vantage point just stop, park and explore. My wife and I have a couple of private spaces where no one else goes where we can sit watch the surf and spend some time together. Arcadia is well known for its carriage roads. This is a system of roads built by the philanthropist John D. Rockefeller Jr. that is only for pedestrians, bicycles or horses. We booked a ride on a horse drawn carriage that took us up to the summit of one of the nearby hills. Great views and a romantic ride for couples and fun for the kids. Last on the itinerary is Cadillac Mountain. Take the auto road to the summit for the best views on the island. Another cancellation station is in the gift shop. For dinner we went to the Jordan Pond House where you must order the popovers. These are airy puffy muffin like appetizers that are out of this world. The food is of good quality especially the seafood. Next up on the other side of the island, a short drive away, is the famous lighthouse. The Bass Harbor Head Lighthouse is one of the most photographed in the country. To get the iconic photo, take the short trail from the parking lot and climb out onto the rocks looking back at the lighthouse. After sleeping in for a few hours the next day we went to downtown Bar Harbor for a morning stroll. I hear that there is another unique cancellation station in the downtown area but we did not find it. We booked a cruise on the Sea Princess going out to Little Cranberry Island in the afternoon so we stopped at the Downeast Deli and picked up some wonderful sandwiches, highly recommended. The cruise left from the opposite side of Mount Desert Island so we made our way to the dock in time for the 1:15 departure. The ranger led cruise sailed by seals sunning themselves and numerous Guillemots frolicking in the surf. On Little Cranberry Island the ranger opened the doors to the small Islesford Historical Museum where there is another unique stamp location. A short walk brings you to the village and if you are lucky the one general store will be open and you can some freshly baked pastry. Definitely a pleasant day on the water. The next day we stopped at the visitor center at the entrance to Mount Desert Island got another unique passport stamp and Alex received a special Junior Ranger badge from the nicer than nice ranger on duty. There is so much more to do you could easily spend more time but even a few days will give you a taste of the unique flavor of Downeast Maine. We also get a lot of spam comments, I wish I knew how to block them. We go in and identify them as spam but it does not seem to lessen the frequency of them occuring!